When people ask me what the best credit card to use is, I usually tell them that there’s no specific card but that they should be continuously applying for new credit cards to get sign-up bonuses. There’s not as much talk about churning on blogs nowadays (perhaps because banks don’t like it when the bigger blogs use that word? ), but I still regularly apply for new credit cards. So what’s next on my list? The card that I most want right now is the Citi Prestige card. It’s kind of like Citi’s answer to the Amex Platinum, and it comes with a Priority Pass membership that allows guests for free, American Admirals Club access, and a $250 annual airline credit. But I’m mostly interested in this card because I have a Citi Forward card that gets 5x Thank You points on restaurants and bookstores, so with the Citi Prestige, I can then redeem those points for 1.6 cents each toward AA flights. That means I can get about 8% back on restaurant spending all year round. Crazy good deal, right? I’ll probably try to pick up another US Airways credit card before Barclays has to stop issuing them and perhaps an Alaska Airlines credit card. I’ve had the US Airways card three times before, so I’m not optimistic about my approval chances, but it’s been 6 months since my last application, so I might as well try. I don’t know how many times I’ve had the Bank of America Alaska credit card, but they keep approving me, so might as well keep on getting those miles, as I recently used 100k to book a first class Emirates ticket. Another card that’s been in the back of my mind for a while is the Chase IHG card. Low annual fee for a free night certificate, and you get a redemption rebate, so it’s worth keeping around. I haven’t gotten to it yet since I haven’t really focused on IHG, and I probably will continue to wait until the 80k point offer comes back (if it does). So not the most ambitious set of credit card applications, but if I get approved for them all, it’ll be about 125k miles/points which I value at over $1800. Not too shabby for minimal effort. This entry was posted in Credit Cards and tagged bank of america alaska, barclays us airways, chase ihg, churning, citi prestige, credit cards on February 7, 2015 by Edward. In the past, I’ve written extensively about how I think the US Bank Club Carlson credit cards are underrated in the miles/points blogosphere. These cards are one reason why I’m a fan of US Bank. More recently, though, I’m a big fan of the Visa Buxx cards offered through US Bank. I’ve been slacking on the manufactured spending front, but Visa Buxx makes for a couple of grand of easy spend each month at minimal ongoing cost. It helps that there are US Bank ATMs where I live, including near my work as well as near my home. To make the process of liquidation even easier, I opened a US Bank checking account, so I can withdraw money and deposit it at the same trip (yes, I hog the ATM for 5 minutes or so). And at the time that I opened my checking account, US Bank was offering a $150 opening bonus, so that just made it all the more worthwhile. Granted, there are things that I dislike about US Bank: namely, their fraud controls are way too stringent. I’ve given up on using my Club Carlson credit cards for any sort of manufactured spend as I hated having to call every single time I made a somewhat large purchase. But Visa Buxx and redeeming two nights for the price of one (which can be stacked back-to-back with two credit cards/Club Carlson accounts) make me a big fan of US Bank right now. This entry was posted in Credit Cards, Things I Like and tagged credit cards, manufactured spend, us bank, visa buxx on November 11, 2014 by Edward. A: Terminal 3, near Gate 74. It’s right beside the airside connector between Terminal 3 and the International G gates, and it’s where premium security at SFO used to be for United. Q: Can I access this lounge even if I’m not flying United? A: Yes! Any boarding pass at SFO will get you airside at any terminal. Note that only Terminal 3 and the G gates of the International Terminal are connected airside, which means that you will have to clear security twice if you want to use this lounge and you’re not flying out of Terminal 3 or the International G gates. You want to leave plenty of time to reclear security, as you’ll need to take the AirTrain to get to your terminal. Q: What are the access policies? A: Free access for Amex Platinum and Centurion card holders, and they get two guests or immediate family members for free. Otherwise, you need an Amex card to have the privilege of buying a $50 one-day pass. If you buy a one-day pass, kids under 18 get in free with you, but those over 18 will need to have their own one-day passes. Q: How can I visit this lounge if I’m not actually flying? A: Buy a fully refundable ticket, get a boarding pass, and then cancel the flight once you’re airside. Or if that seems morally dubious to you and you have a different lounge membership, you can often get access to the club even if you’re not flying. For example, for American Admirals Club members, you can call and they’ll arrange to have a fake boarding pass ready for you at the check-in counters which you can use to get airside. You can also arrange these boarding passes for other people. See AA’s Admirals Club FAQ page for more information. Note that you’re supposed to have a business purpose for this. A: The food is significantly more elevated than most options that you would find at an airport. Bread was tasty, liked the salad, pumpkin was good. Overall, decent options for vegetarians. The rice was terrible, though. It was left out too long so the top got really crunchy. I didn’t try the meat entrees, but my friends enjoyed them. Desserts were solid. But there seemed to be issues with keeping up with demand, as every time I went up to the buffet there was at least one thing missing. See the food menu here. Q: How about the drinks? A: Lots of wines on offer, and you can get a code to taste up to 5 pours (your alcohol consumption is not limited at the bar). Cocktails were good, according to my cocktail aficionado friends. See the drinks menu here. A: There’s only one shower suite, but it’s pretty nice as far as domestic airport showers go: spacious, good water pressure and temperature, and there was a normal-sized bar of organic olive oil soap (I can’t remember seeing bar soap in any other airport lounge). The towels are pretty ratty, so hopefully they replace those. While there isn’t a physical divider between the shower floor space and the floor space of the rest of the shower room, water did not get everywhere. Q: How is the lounge for getting work done? A: Many of the seating options have built-in electrical outlets, which is a nice touch. The lounge isn’t that big, and even on day 1 of operation it was quite crowded, so it might be hard to find a quiet place to work. Wifi is fast. No real quiet areas if you need to take a call. A: There’s a family room, which is good for people traveling with children. They also have luggage lockers. A: Overall, a nice lounge, and one that tempts me to reapply for an Amex Platinum card. But I don’t fly United any more, and I generally get to the airport with less than 10 minutes to spare before my flight boards, so I probably wouldn’t go out of my way to come here even if I had an Amex Platinum card. But it’s probably a better place to grab a drink and a meal than anywhere else at SFO. 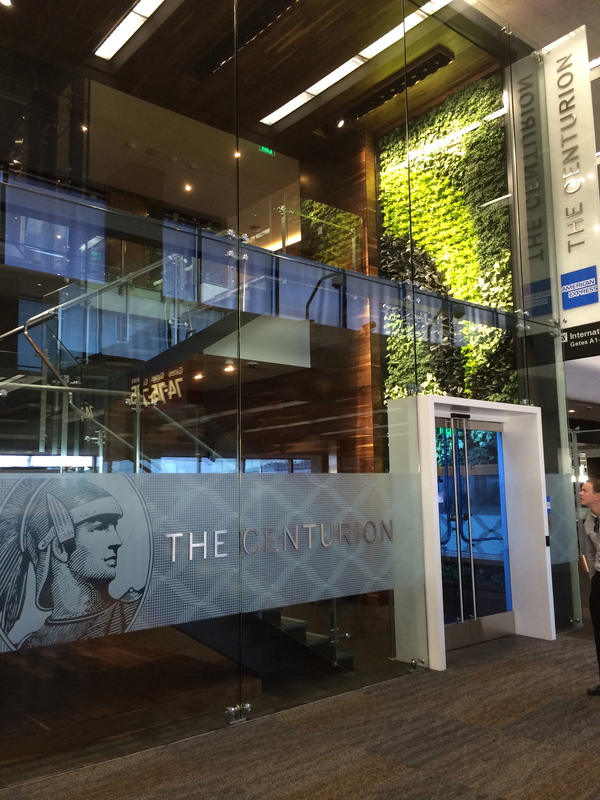 This entry was posted in Credit Cards, Lounge Reviews, Travel, Trip Reports and tagged american express, centurion lounge, credit cards, sfo, travel, trip report on November 6, 2014 by Edward. A lot of bloggers have said that the Chase Hyatt credit card is one of the cards to keep and pay the annual fee on every year because the card offers a free anniversary night certificate redeemable for a category 1-4 Hyatt property for an annual fee of $75. Since the annual fee just posted on my account, I was forced to think about whether this made sense for me. Even though paying $75 for a night at a category 4 Hyatt property makes sense in comparison to paying the cash rate at many hotels, that’s more than I’d typically spend on a single night since I’m often content skimping on lodging and doing things like staying at capsule hotels or using Airbnb. The card does offer double points on restaurants and some travel expenses and has no foreign transaction fees, which is nice given that I no longer have a Chase Sapphire Preferred. But then I realized that all of this thought process was irrelevant. It makes almost no sense for me to keep the credit card given that I regularly apply for new credit cards. Chase cards can be churned every 24 months, and you keep award night certificates earned in your Hyatt account even if you close your credit card. Thus, I can cancel my credit card right now, keep the free category 1-4 certificate that has already posted to my Hyatt account, and then reapply for the same credit card in 12 months and get two annual free nights. Scenario 1: Keep the credit card and pay the annual fee. October 2013 – Applied for credit card. Received 2 free night certificates and $50 statement credit. End result: Pay $100 ($75 annual fee x 2 – $50 statement credit), get 2 free night certs and 2 free night cat 1-4 certs. Scenario 2: Close the credit card and churn at next opportunity. October 2014 – Close card, receive 1 free night category 1-4 certificate. October 2015 – Apply for credit card #2. Receive 2 free night certificates and possible additional statement credit. End result: Receive $50 (or more), get 4 free night certs and 1 free night cat 1-4 cert. Granted, in scenario 2, there might be a slight delay in terms of when I can apply for credit card #2 since the terms do state that it should be 24 months since the last time receiving the bonus and not the last time applying for the credit card, but still, scenario 2 is strictly better for almost everyone. And while scenario 2 does require meeting another minimum spend requirement, it’s only $1000 for this credit card. This entry was posted in Credit Cards, Hyatt, Travel and tagged chase hyatt, credit cards, travel on November 4, 2014 by Edward. …and not the Chase Ink Plus. There are rumors that the Ink Bold is going away, and I’ve never had a Chase Ink card, so I figured I might as well try for the Ink Bold. Yes, everyone is screaming about the Ink Plus right now. 70k UR points is a lot. But they’re not quite as valuable to me as they were in the past since United has devalued, which is why I haven’t rushed to get any of these cards. And while I don’t have any foresight into whether or not the 70k points offer will come back for the Ink Plus, I’m pretty confident that we’ll see 60k point bonuses again, so getting an incremental 10k isn’t that important to me rather than getting an incremental 50k if the Ink Bold were to disappear as a product prior to me ever getting it. After applying, I got a decision pending screen, so I called the business reconsideration line (1-800-453-9719). The rep didn’t ask any questions–she just put me on hold for a couple of minutes and then came back to say that I was approved. This is possibly because the only Chase card that I have left is the no annual fee Chase Freedom, which I scarcely use unless the 5% category is something that I normally spend lots of money on (i.e. only when it’s restaurants). And no, I didn’t use anyone’s referral link. Does that make me a bad blogger? This entry was posted in Credit Cards and tagged chase ink bold, credit cards on September 30, 2014 by Edward.